I love black and white stripes for graphic impact. 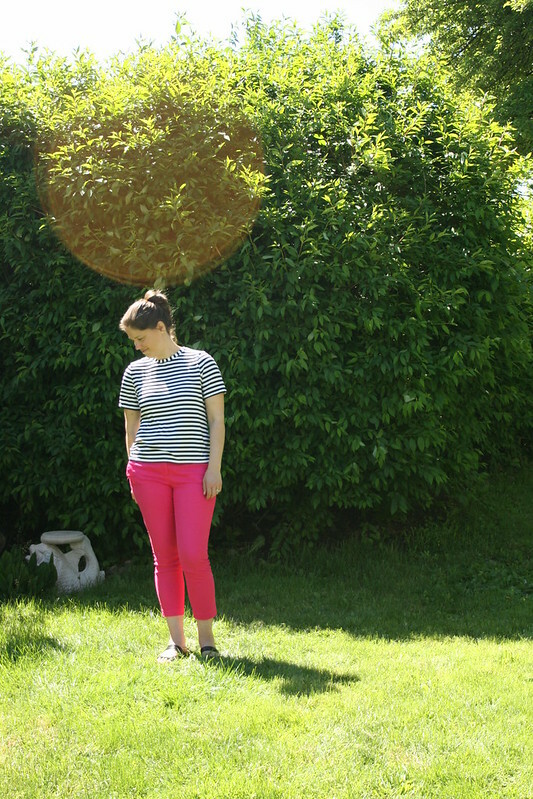 It was something I never thought about until a few years ago when I bought a black and white striped shirt. It went with so many things and brought something really cool to every outfit I paired it with. About a year ago, I would have said that it was crazy to spend time sewing t-shirts when they can be bought so cheaply, but I think differently now. T-shirts are quick, satisfying, and really fun. They are the perfect project in between more difficult projects because, not only are they fun and easy, they build your wardrobe. 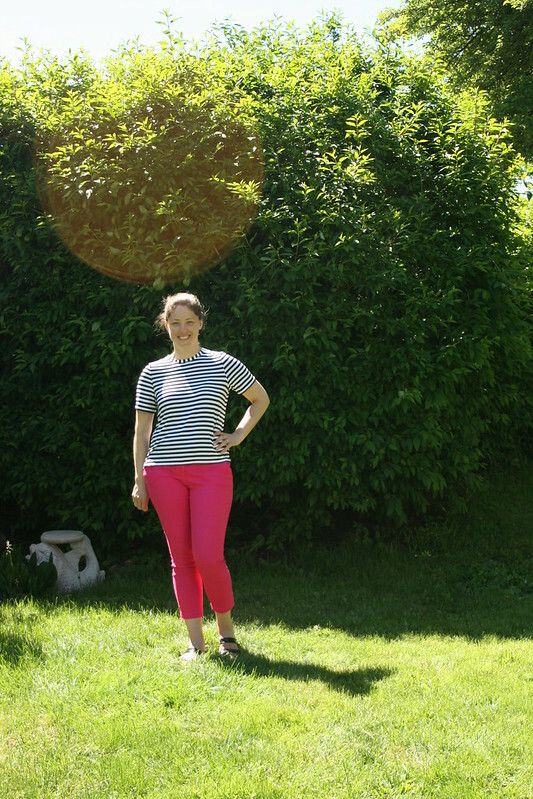 For all these reasons, I decided to make a black and white striped Lark Tee (pattern by Grainline Studio). Because I planned to wear this shirt untucked, I cut off about 4″ using a stripe as my cutting guide, which was just right. (For reference, I’m 5 feet, 8 1/2 inches tall.) I tried to cut the neckband with one stripe going around the neck, but it didn’t work out well, so I switched to the neckband you see in the pictures, which I really like. The fabric is a really nice rayon/Lycra from Pintuck & Purl. I would say it’s somewhere in the light- to mid-weight zone, but is still fairly opaque. It was great to work with. Overall, I like this pattern. Sometimes I wish there was a little more shaping on the sides, but I can always add that later. I would really like to try a v-neck version at some point, maybe with this fabric, but we’ll see. Do you have any favorite t-shirt patterns you want to share? I’d love to hear about them in the comments. Bird feeders. My family got me a pole you can attach to a railing as well as a bird feeder for Mother’s Day, and I love looking outside and watching the birds. I think I need a hummingbird feeder that is easier to clean, though. We have an old one, and it gets dirty quickly and is hard to clean. Does anyone have any resources for making or buying an easy-to-clean hummingbird feeder? I may have mentioned this book before, but I’ve been looking through Leda Meredith’s book Northeast Foraging over breakfast most mornings. It’s fascinating. This year I want to try Salicornia. What if this happened every time we used “literally” when we actually meant “figuratively”? Hahahaha! Looks great – I’ve been feeling myself being drawn to navy and white stripes lately which is totally not normal for me, but I’m thinking I’ll have to go for it – stripy T shirts all around! We bought a new hummingbird feeder recently. Love it…so much easier to clean and it has a lifetime warranty. The hummers really love it! You’ll see it soon. Love the tshirt….great job! 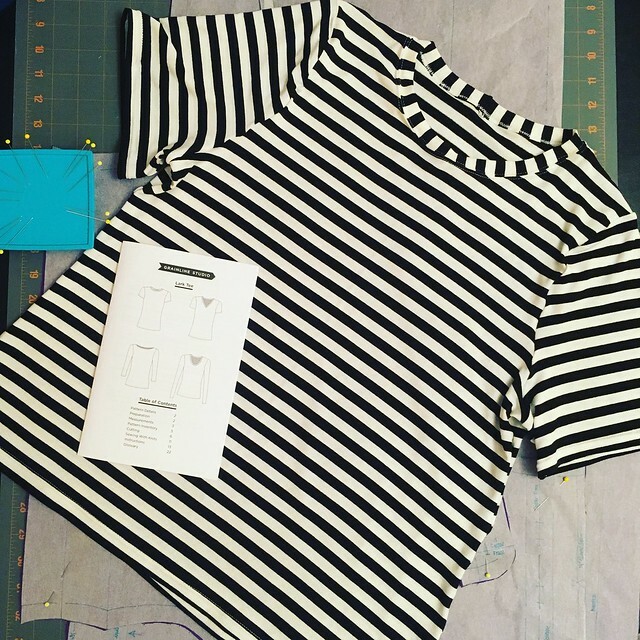 love this shirt, I use the same t-shirt pattern and made a version in stripe but messed up on the hem so I need to make another. 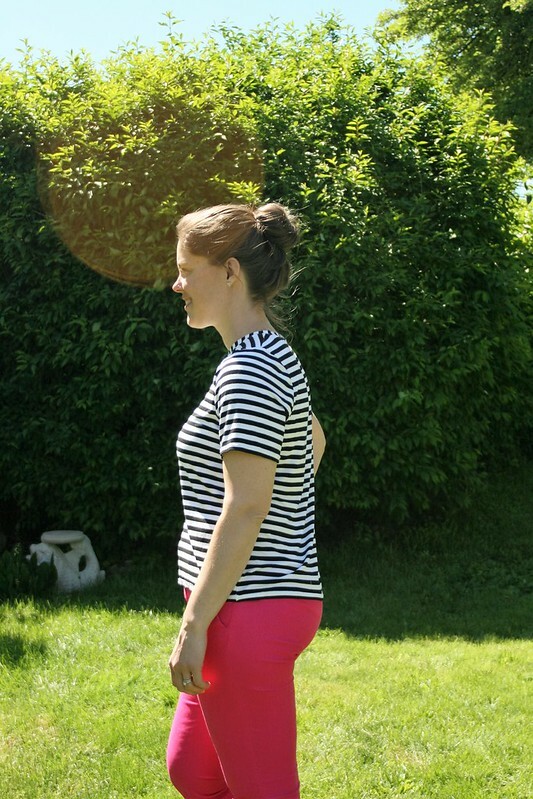 Love the stripe you chose, a good stripe is hard to come by in the right weight and size! Perfect length too! Love it! Opps, I do not mean that literally…I mean it’s not like I want to marry your T-shirt. I like it a lot!!!! Looks really great on you too.